Show your trust in God's plan for your life and sign up to spend one hour a month with Jesus in Adoration. Schedule some time to talk and pray with Him as He is waiting for you. 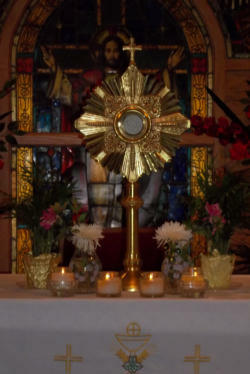 Eucharistic Adoration times are from 8:30AM-6PM, the first Friday of each month. 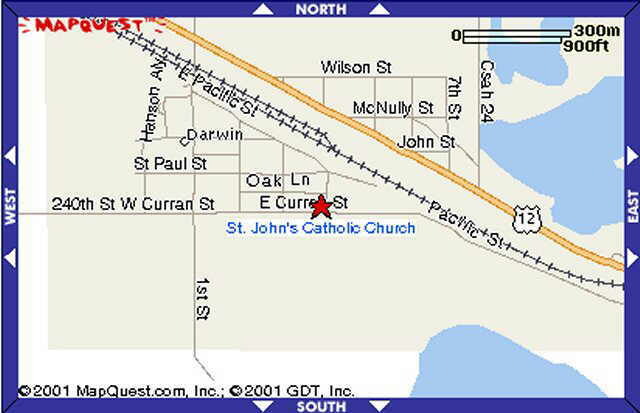 For more information or to schedule a time, please contact Deacon John at 320-221-4987. You are invited to join us for Eucharistic Adoration at St. Philip’s on Tuesday with exposition of the Eucharist following the 8:30am Morning Mass and ending with benediction at 5:00pm. Everyone is welcome to come and pray before the Blessed Sacrament. If you are unable to be present at the time you have signed up please contact Mary at 593-6080. Here is another pertinent comment by Ven. Fulton J. Sheen. "Neither theological knowledge nor social action alone is enough to keep us in love with Christ unless both are preceded by a personal encounter with Him. Theological insights are gained not only from between two covers of a book, but from two bent knees before an altar. The Holy Hour becomes like an oxygen tank to revive the breath of the Holy Spirit in the midst of the foul and fetid atmosphere of the world." This essay was originally an address to the clergy of the Archdiocese of Saint Louis at a symposium on Adoration of the Blessed Sacrament on February 2, 1998, sponsored by Archbishop Justin Rigali. True - John A. Hardon, S.J. "In a society such as ours that rejects metaphysics, glorifies moral relativism, promotes blatant materialism, and whose academics are busy deconstructing the truth, it should not surprise us that an enormous spiritual void has emerged, which many desperately try to fill with frenetic consumerism, joyless hedonism, or bogus spirituality." There is no monitor or video screen at eucharistic adoration, no figures or colors shifting across the screen. We simply sit and look at a round piece of bread encircled by light. That bread is the Body of Christ, the consecrated Host, before which countless Catholics gaze in rapt adoration throughout the world. "The Church Militant and each Christian lives within the eschatological reality of an 'already' and 'not yet' achieved salvation. The Kingdom of God is already among us, we already share in the heavenly banquet; but this sharing in God's Kingdom and this banquet has not yet been achieved in its final, definitive fullness. The Church, therefore, lives in hope of attaining this final fullness, a hope strengthen by already participating in the eschatological promises." "The Eucharist is at the very core of the life of the Church and gives the Church its identity. The Church is the Body of Christ, and, as St. Augustine taught, we receive the body of Christ in order to become the body of Christ: 'Be what you see and receive what you are.' The whole mystery of Christ and of the Church as his body is what we receive in the Eucharist. This sacrament therefore renews our life together in Christ; in other words, it renews the Church." "Pope John Paul wants to launch the Church strongly into the new millennium. To have a year concentrating on the mystery of the Eucharist is a vital part of this project, because the Eucharist contains riches to feed and forgive us, to strengthen and unite us, and to guide and protect us on our pilgrim way. Jesus himself is with us and we recognize him in the breaking of bread, as the disciples did at Emmaus." "The Forty Hours devotion recalls the time span during which the body of Christ lay in the tomb. The practice of this solemn exposition began in Milan, somewhere between 1527 and 1537. It seems to have been first proposed by the founder of the Barnabites, St. Anthony Zaccaria, although accounts vary."